Though this leather office chair is remarkably comfortable, it's best feature by far is the pull up/swing away tablet arm. With today's technology getting smaller, the 14"W x 9.50"D tablet arm is large enough to allow you to utilize your iPhone, tablet computer or laptop right in your chair. This adjustable position tablet arm also features a non-slip coating and a shelf edge to keep your stuff where it belongs. This chair is perfect for "brainstorming" rooms as well as conference and training rooms. It is so comfortable you won't want to go back to your desk. 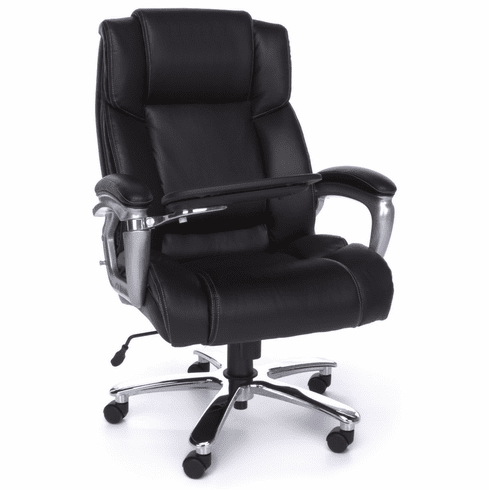 The ORO200 features rich, black bonded leather and padded arms for comfort and durability. It is Greenguard certified, has a 400 lb. weight capacity and comes with a large 29" base with dual wheel casters for stability. Pneumatic seat height is standard as well as the ability to tilt in the chair. Limited lifetime warranty from OFM. Dimensions: Seat Size: 24.50"W x 21"D. Back Size: 23.50"W x 31"H. Seat Height: 19.50" - 22.50"H. Overall Height: 45" - 48"H. Overall Width: 31"W. Overall Depth: 32.50"D. Base Size: 29". Meets and/or exceeds ANSI/BIFMA safety standards. The OFM ORO200 typically ships out in 1-2 business days from NC.